I got a new job in December last year and it has been very busy since. Not so busy that I haven’t been able to get out and activate some National Parks and SOTA summits, just too busy to sit and blog about it. Below I’ll summarise my recent activations. 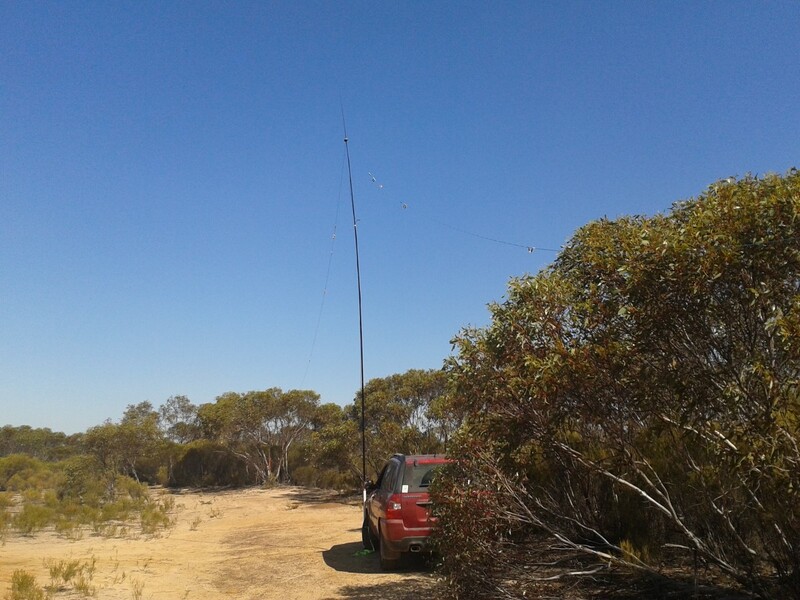 Activating the Organ Pipes National park I set up in the car park and ran my FT450D into my linked dipole . I was looking for 44 QSOs to ensure qualification for the global WWFF award as well as getting some new bands for the Keith Roget Memorial National Park Award. 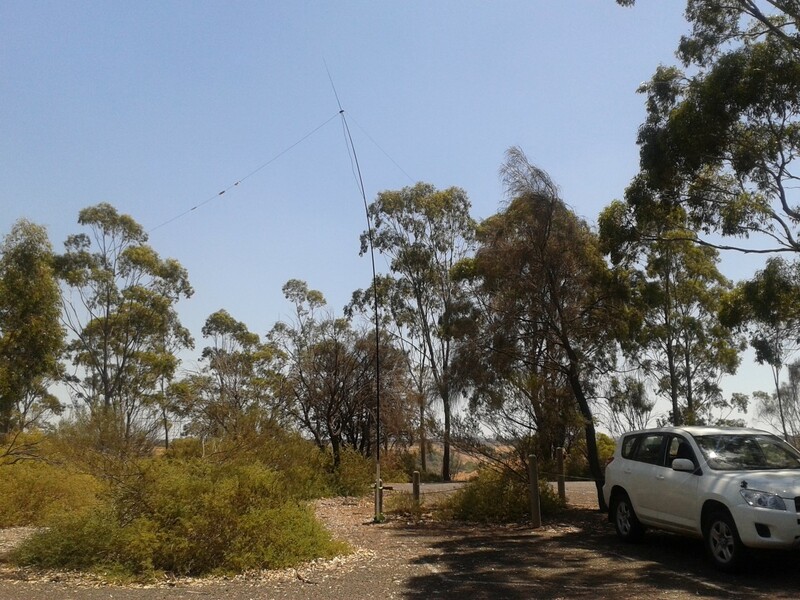 It was the hottest day February day with the temperature getting just above 40 C.
Starting just after 0000 UTC and running for 4 hours I tried 10, 12, 15, 20 and 40 metre bands with contacts on each band. Local QSOs from VK2, VK3, VK5 and VK7 and DX contacts in USA, Thailand, Japan, East Malaysia, West Malaysia, Hawaii, New Zealand and Slovenia. 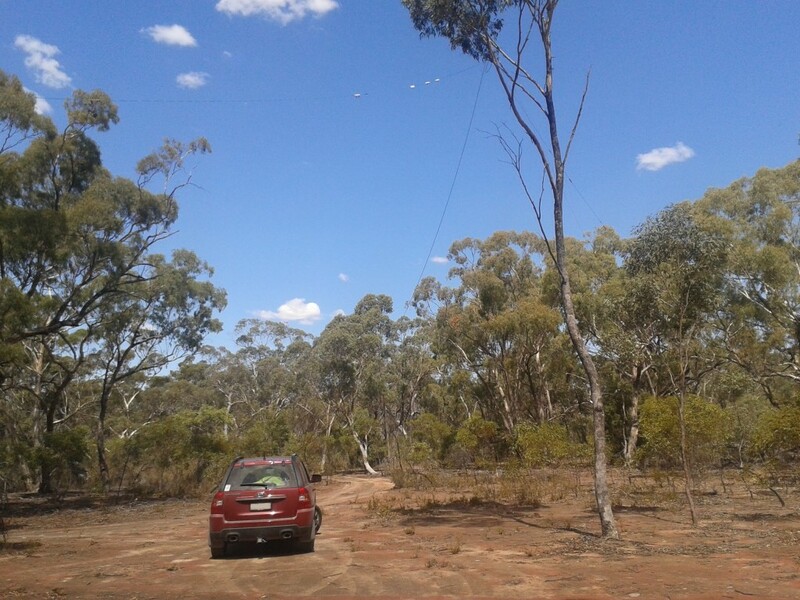 All up I made 46 QSOs with 42 unique stations and met with Peter VK3TKK who lives nearby and dropped in to say hello. Setting up in the Sapling Gully Picnic Ground I was again activating for the WWFF and KRMNPA award. Using both my FT450D and FT817 I logged 50 QSOs across 15, 20 and 40 metre bands. 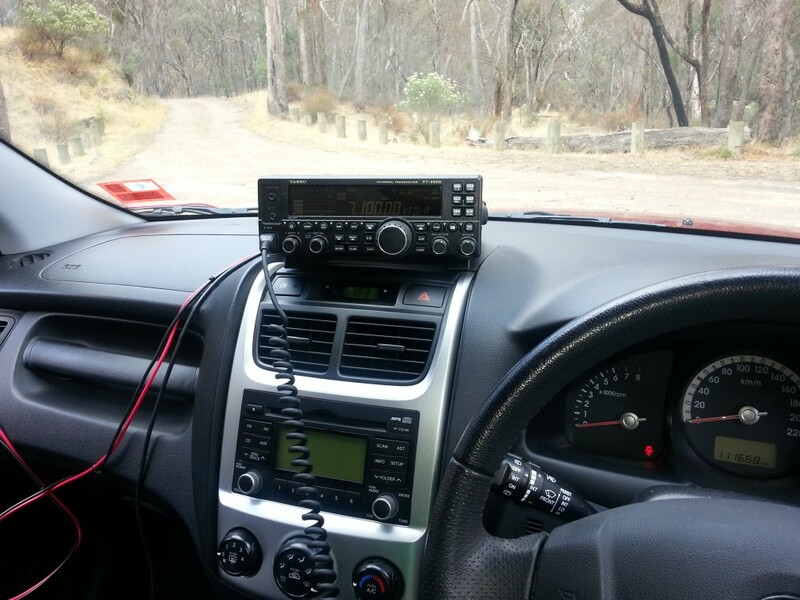 Keen to work two National Parks I was looking for enough stations to total 10 QSOs from each park to qualify for the Australian activation section of the WWFF award. 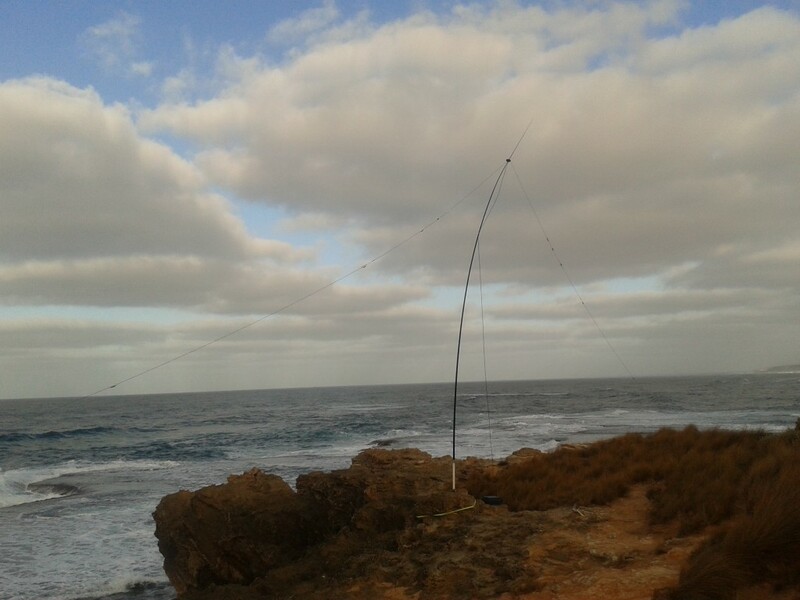 I had some earlier QSOs from Mornington Peninsula and made 9 QSOs on 7 MHz from the small cliff at Spray Point, right on the edge of Bass Strait. Moving to this park right after Mornington Peninsula National Park I walked up to Monash Light and set up the FT817. Working for just over 90 minutes I got 15 QSOs in the log on 40 metres, and one QSO each on 15 and 10 metres. Continuing to build my QSO count toward the global WWFF award I head back to The Lakes National Park, last visited in January 2012. This time I took insect repellant and saw no mosquitoes. 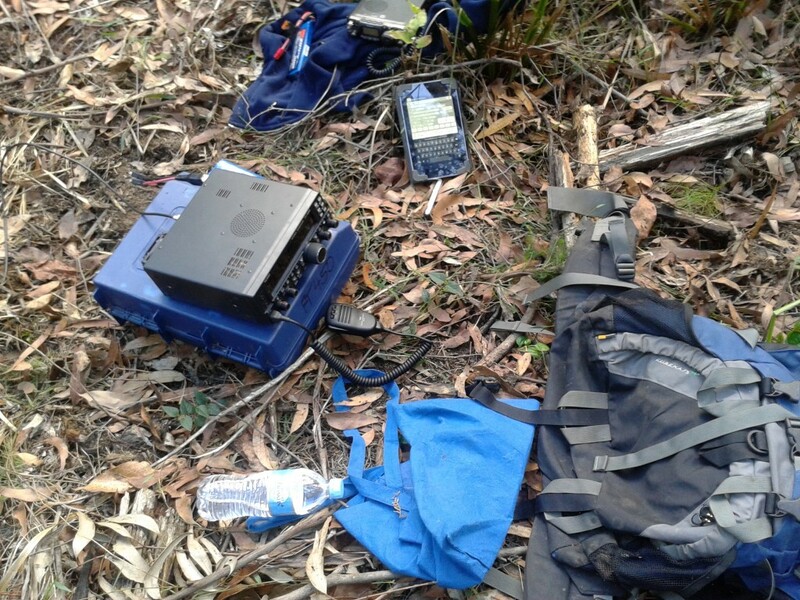 I came away with 54 QSOs in the log including new activations on 10m and 80m and QSOs in VK1, 2, 3, 5, 7, USA and New Zealand. On the way home from The Lakes National Park I stopped by Dingo Ridge SOTA summit approaching it from the south east. From the Princes Highway travel north along Garfield North Rd then veer left into Petigrew Rd. From GPS -38.0229, 145.6735 a management track, signposted as private property, heads uphill and eventually appears just west of the summit. The walk up and back is steeper than the West ( Jul 2012) or North West (Nov 2013) approaches I have previously taken but takes about 30 minutes each way rather than the hour plus of the other tracks. Working on 40m I made 27 QSOs in about 40 minutes. Still building on my WWFF tally I headed north west into the Little Desert National Park, setting up just of the bitumen in the Central Block. I was on air for 4 1/2 hours and made 76 QSOs from including 39 DX stations. The DX was streaming in once I was spotted on the DX cluster. There are many stations overseas that want to work National Park Stations. Tony VK3VTH was over at Mount Richmond National Park. Working him gave me one more new “chase” park for the KRMNPA. Tony also had a good run with DX stations in the afternoon. 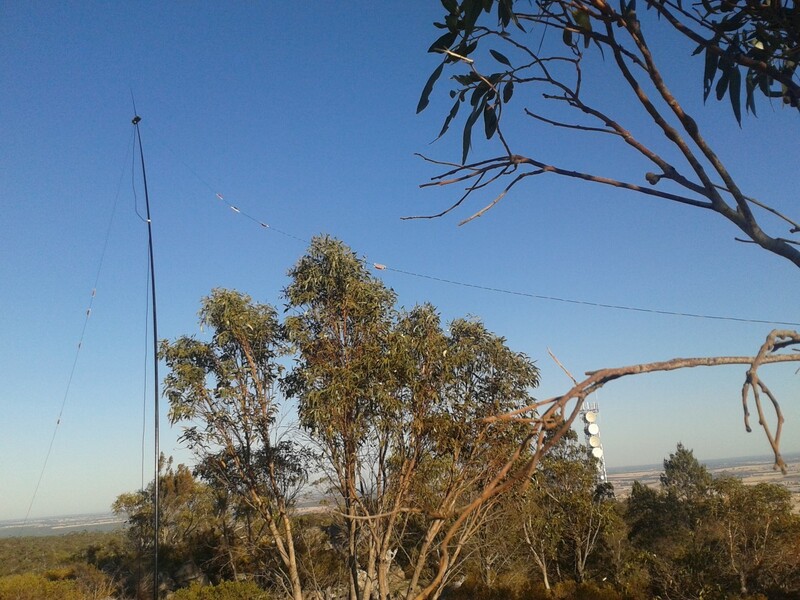 Starting early I drove to the top car park of Mt Arapiles, determined to activate the SOTA summit on 80 metres. After walking out of the activation zone and back in I climbed the stairs to the top and set out the full 80 m linked dipole. Starting at 8am local I worked VK3CAT and VK3PF with signals around S5 rather than the S9 we normally enjoy on 40m. With no other responses I broke in to a rag chewing net to get three more calls in the log then finished up with VK3AFW. From Mt Arapiles I headed to the Grampians National Park, about 6 km east of Dadswells Bridge, 400 metres south of the Western Highway. Here I made 47 QSOs but only 3 DX stations as I missed the DX opening to Europe due to a battery problem. I now know that the FT450D stops working at the same point that the car battery will no longer start the car. I tried calling local VK3SSB on the phone for a jump start but he was out of town. After waiting about one hour I tried the car again and it started. A valuable lesson. 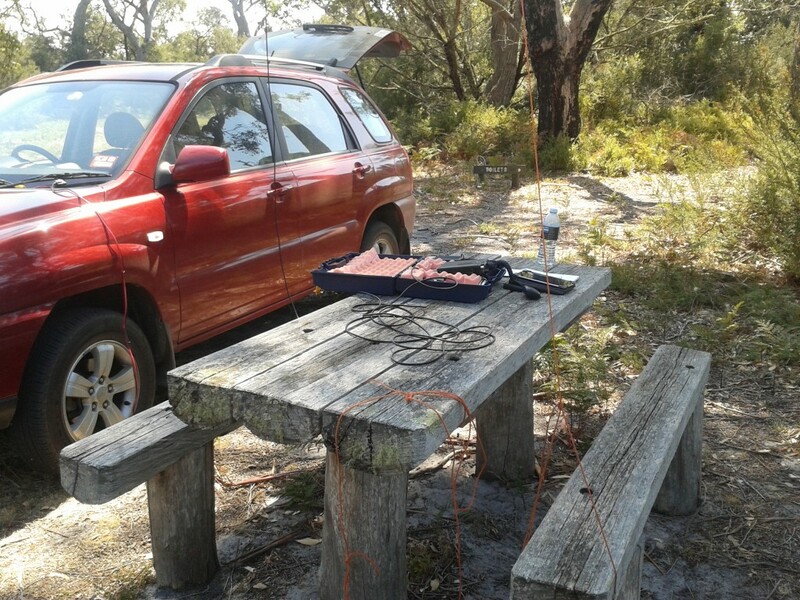 On the way home I pulled over into a picnic area to work Nick VK3ANL on Mt Ida VK3/VU-009, also part of the Heathcote – Graytown National Park. This was also another new “chased” park for me. 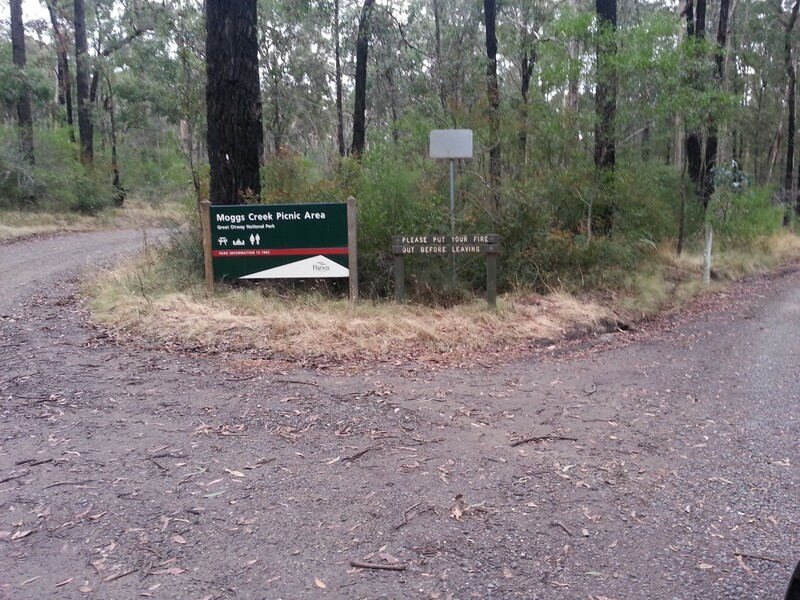 After completing the popular Lorne to Erskine Falls and return hike with an old workmate, his wife and a mate I stopped by Moggs Creek Picnic Area and activated the park for about 90 minutes for 16 QSOs. I qualified this park on QRP, 12 and 80 metres. Leaving home just after 6:30 am I was trying for three or maybe four summits in one day. Mt Little Joe VK3/VC-027 was the first summit attempted. I activated this back in April 2013 and, knowing how sore my knees get walking down steep hills, I was keen to find an easier route. Passing the first track up on the left I took the second track which became overgrown and was not much shallower than the first steep track. After a brief activation, only 26 QSOs, I headed up and down a few other tracks looking for an easier route. Indeed there is an easier route found by following the track from the Old Warburton Rd for about 2.2 km then turning left for about 650 metres then turning left again and heading to the summit about 700 m away. From Mt Little Joe I drove over to Mt Bride VK3/VC-009 following the same route as last year. Mt Bride is a quick walk up to the summit plateau. Here I was rewarded with 17 QSOs including a DX contacts with Mike AD5A. After walking down from Mt Bride I headed to Britannia Range VK3/VC-011. 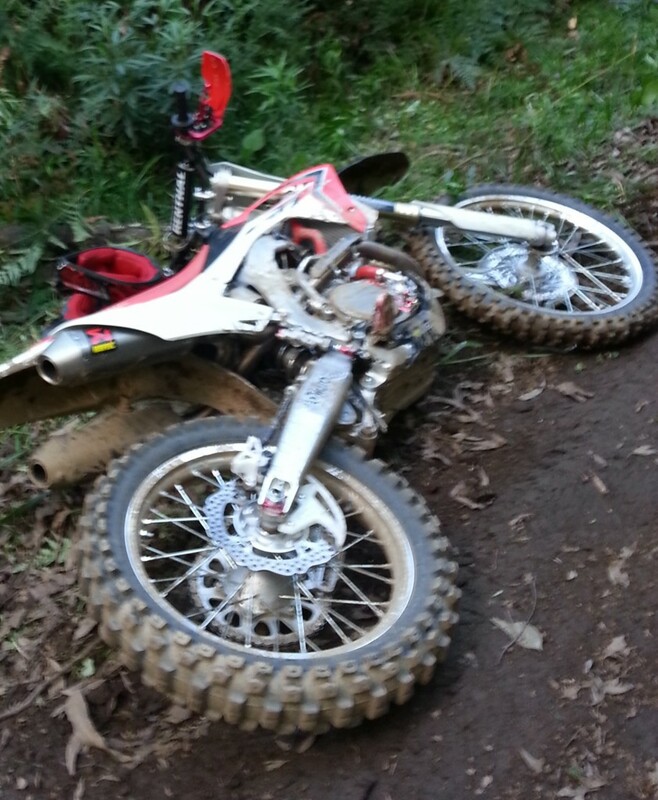 A few 100m up Britannia Track I found a Nissan four wheel drive balanced half way through a U turn. I watched for a bit while the driver turned it around without incident. I continued up to the small clearing near the top of the summit. From here I worked 14 QSOs before heading down. As I was walking back down Britannia Track, thinking I might be able to squeeze another summit in I came upon a young motorbike rider, Sam, who had fallen from his bike. Sam was heavily concussed and may have injured his shoulder. No other injuries were present. Over the next hour I talked with him, having the same conversation every 5 minutes, and determined that he had been riding with a friend who had gone off to get a Subaru. Knowing the Subaru was not going to make it up the hill we started walking down. We were about 900 m from my car and I figured if we got to my car we could at least stay warm while waiting for his mate to return. After walking about 15 minutes two of Sam’s friends arrived on another motorbike. His friends were able to take his bike back to their car, about 2 km away, while I walked Sam to my car and then drove him to meet his friends. The time with Sam was important but it did mean I wasn’t going to fit a fourth summit in. 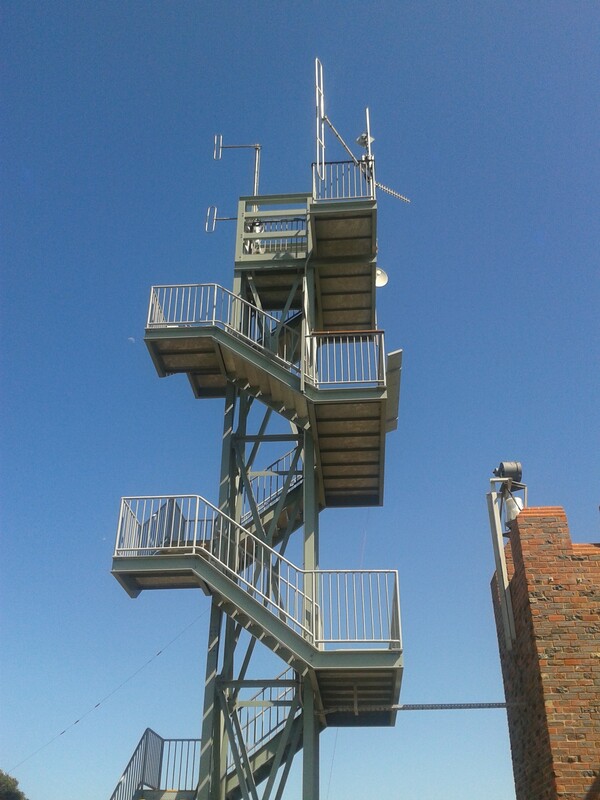 With a bit of spare time on a Sunday I headed off to one of the new VK3 summits,VK3/VC-037. This summit is the closest summit to home at 24.9 km direct line. The access to this summit is easy and one can drive into the activation zone, which I did. Knowing access would be easy and not far to walk I packed my FT450D and the now swollen 8.4 Ah LiFePo4 battery along with antenna and FT817. Taking the FT450D was a test to see how long it would last on the one battery. I hiked from the car down Nichols House Track, until I was out of the zone and then walked back up. I started out on 40 metres, later moving to 12 and 20 metres to work some DX. I must admit to enjoying the compliments from other stations about my ‘big’ signal from the FT450D at about 80 Watts. The 8.4 Ah LiFePo4 battery lasted 1 hr 45 minutes before being unable to drive the radio, needing me to swap to the FT817 for the last few QSOs. I made 55 QSOs with the big radio and four QRP QSOs. 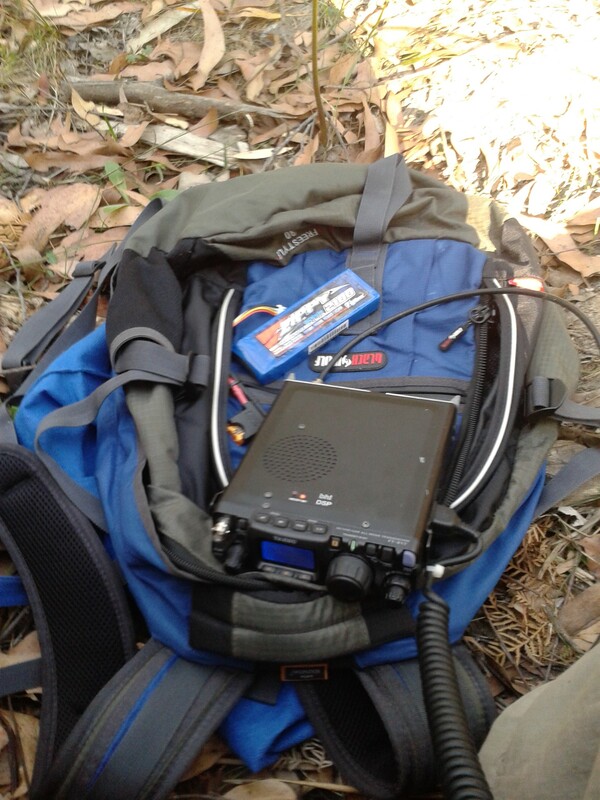 This entry was posted in Amateur Radio, KRMNPA, SOTA. Bookmark the permalink.